You are at:Home»Photos»HOT JANMASTAMI NECTAR!!! + Janmastami Harinama Pics!!! HOT JANMASTAMI NECTAR!!! + Janmastami Harinama Pics!!! ..Krishna is smart, He is expert. Krishna is very expert because it is said that Krishna in one stroke can fulfil many purposes! One who can do that with one action, fulfil many purposes ,is considered expert- that is Krishna. So Krishna has all these amazing qualities and it is said that the pure devotee can get 48 of the 64 qualities of Krishna to a partial extent, not to the full power as Krishna but can get 48 of the 64 qualities. It is said that Lord Shiva and also the eternal residents of the spiritual world, the Nitya Siddha devotees have up to 55 of the qualities of Krishna. It is said that Lord Narayan has 60 of the qualities of Krishna but it said that Krishna has four unique qualities that even Lord Narayan doesn’t have. He has a beautiful form – no one…no one is as beautiful as Krishna, of all the incarnations – everyone is extremely beautiful but Krishna even more so. 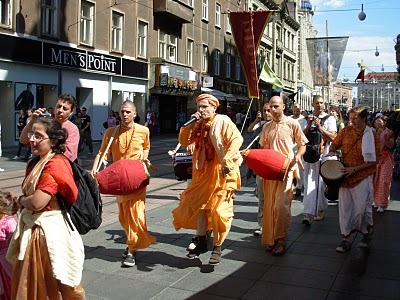 He is also performing amazing pastimes in the association of his devotees. No one is performing such pastimes and Krishna’s childhood pastimes are just very very amazing. Nothing compares! Krishna in his childhood pastimes! Krishna plays on His flute, He plays on His flute – that can do the most amazing things. It is said that when Krishna plays on His flute, the cows- when the cows hear that sound. They forget everything and they have to go near it. And then when the sound enter s into their ears – it is just to intense and it just overwhelms them. They just cant tolerate it, it is too much, that is the effect of that sound, they stand on their hind legs and they cover their ears and they try not to hear this noise! But still they hear it, then they take a blade of grass in their mouth as a sign of humility and they just offer obeisances before Krishna and begging to please stop! Then Krishna who has no mercy just continues playing and then those cows become frozen! They become frozen and they can no longer move. So it is said in this way that by playing His flute Krishna turns the moving living entities into non moving! The trees they begin to shake, they start to shiver and in this way turn the non moving entities, into moving entities… and that is the flute of Lord Krishna. 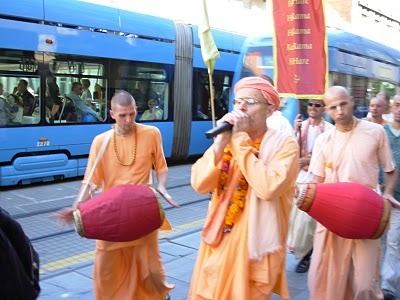 That flute of course is attracting the entire universe, that transcendental flute of Krishna, all the devotees are just listening to that flute . When Krishna goes to the forest and plays His flute, the thunder in the sky is making rhythmic sounds in the background, in this way playing like a huge mrdanga along with the sound of Krishna’s flute. …. So this day on Janmastami, it is a day to have a good time. It is day not to be in total anxiety! Maha anxiety.! No! it’actuallys a day to first of all relax, we have time today. It is a day to take time for Krishna and to say ‘no forget it’ we are not too busy today. 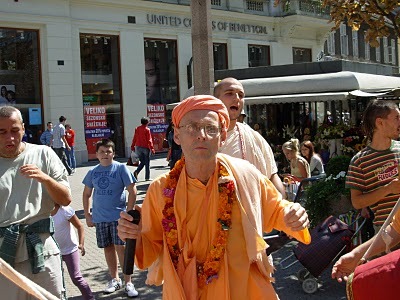 Everyday we are too busy to take time for Krishna , there is always something going on- if you know what I mean. ‘Everyday, God, so much to do, when can I chant, when can I hear about Krishna , when can I do some service for Krishna, when oh when oh when? !’ that is the question. But Janmastami is different, Janmastami is the day that we have time, we have an ocean of time because we stay up very very long tonight and therefore on Janmastami, the whole day is just for Krishna. If you have to work today, just ring them up and say I don’t know what happened but I’m not well today!’ If you have a shop just say’closed’’ not home’ whatever it may be!! Today we are simply spending the whole day with Krishna. That is how Janmastami will be a success. 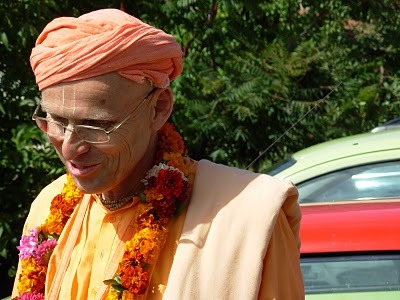 It is a day that one takes time, Janmastatmi is a day that we go deep, it is a day first of all to take time to be with Krishna, to connect with Krishna. Sometimes we get so busy in serving Krishna that we forget Krishna! Has that happenened to you also?! 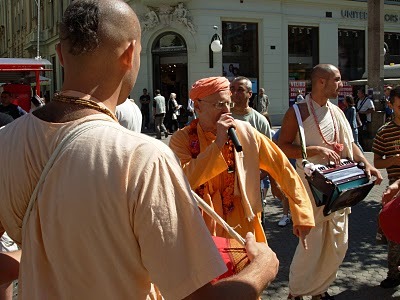 But today is a day to connect with Krishna and to actually go deeper, to remember , to hear, and to chant. 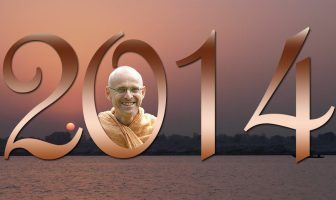 It was a good year – Welcome 2014!